The Boston Marathon bombing will have consequences in the weeks, months and years to come. I plan to write about some of these points at more length, as time allows, but I wanted to briefly outline a couple of the most significant issues raised by the attack so we can start thinking and talking about them. Budgets: Most people working in counterterrorism studies have seen training and research money dry up pretty significantly over the last two years in the United States, especially relation to Islamist and Al Qaeda-inspired terrorism. The Boston bombing may or may not herald a change in the tempo, effectiveness or essential nature of the homeland terrorist threat, but will it change the budget dynamics? Should it? Focus: Not unrelated to the first point, many people who study terrorism and extremism have, over the last two years, refocused on the prospect of domestic right-wing terrorism as the "next big thing." This was reflected in the widespread speculation about right-wing attribution of the attack in the early hours and well into the week. We were only beginning to see a commitment to the study of non-Muslim domestic extremism from academia, credible NGOs and the private sector. Will those studies -- which I think are important -- be sidetracked by the attribution of this attack? If they continue, will they continue to be confined only to "right wing" extremism? Or will all of this remain a cobwebbed corner of the research world until something terrible happens, and everyone asks why nobody saw it coming? Attribution and the definition of terrorism: The question of attributing the Marathon bombing ran hot last week, with a lot of rampant speculation in the media based on little or no information, blaming a number of possible motivations and even speculating the bombing was not political. With a suspect captured alive and additional information flowing in rapidly, it looks like we'll get some answers to these questions in the weeks ahead, but we still haven't figured out how to handle cases where attribution is weak or absent -- for example, the 2012 Sikh temple shooting in which an avowed white supremacist carried out a mass shooting against non-whites, but without leaving a statement of his purpose or any particular clues as to his motivation (aside from being a white supremacist). Given the events of the last 18 months, it's increasingly clear we need to define what is terrorism and why, so that we can craft consistent policy responses. The definition of Al Qaeda: Sorry to be a broken record on this, but we still haven't fixed the problem I've been talking about for years now -- what is Al Qaeda, what isn't, and how do those definitions affect policy and counterterrorism strategy? News coverage and speculation about the attacks this week highlighted this continuing problem, and it was further emphasized as the media rushed to try to figure out exactly what a Chechen jihadist is and whether it has to do with Al Qaeda. We need a clear consensus definition of Al Qaeda, so that we can craft consistent strategies and policies. Until then, we will continue to flail around every time a counterterrorism issue arises. The mainstreaming of conspiracy culture: We entered a brave new world last week when a reporter from the conspiracy Web site Infowars trolled CNN's live coverage with a bullhorn and crashed not one but two press conferences related to the bombing with questions about whether the attack was a "false flag" (meaning it was staged by the government to justify draconian security measures). Infowars and sites like it are increasingly driving chatter and defining world views among domestic extremists on both the right and the left, but there's very little study of this issue and very little understanding of how conspiracy theories, whether specific or generalized, do or do not relate to extremism and the prospect of violence. It's time to start shining a light on this issue. For more information about J.M. 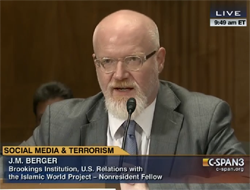 Berger, visit www.jmberger.com or buy his book, Jihad Joe: Americans Who Go to War in the Name of Islam. Contact information is available at the top of this page.